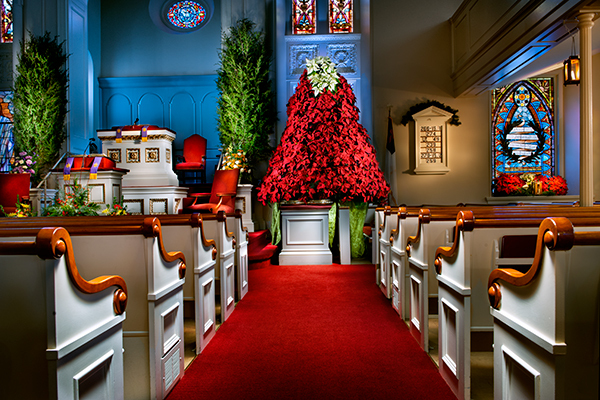 Residents in the small town of Lititz,Pa have many unique traditions that make the community special and one that I find particularly beautiful is the Lititz Moravian Church’s Annual poinsettia tree that is set up on thanksgiving weekend in preparation for the first Sunday of advent. The tree features one hundred poinsettias given in honor or remembrance of someone and stands approximately twelve feet high. The beautiful tree is only up a short period because it cannot be watered in the sanctuary. I remembered this is the time of year the tree is assembled so I headed over to see if there was any chance I could have access to taking a photo and I was pleasantly surprised by the gracious reception shown by the Pastor to my request. I essentially was given full access to do something for an hour and these two shots are what I accomplished. The well-known Moravian star is hanging at the front but was real tough to incorporate in my composition and was unlit at the time,so I never thought about including it till I decided to light it with my spotlight,but by then I was locked into my composition. The entire sanctuary was dark for my shots and I wished the lights could have been turned on but I forgot to ask about that,so I made due with my spotlight to do everything you see here.Even the lantern in the top photo on the upper left was lit using my spotlight ,and I think it looks like a real candle in there.I feel so blessed to have been given the opportunity to capture something so beautiful. Maybe someday those who view this image will get the chance to see this display in person. This entry was posted in Christmas, Light Painting, light painting, Photography and tagged Christmas, Church, Glow, Glowing, lancaster county, Light Painting, lititz, Lititz Moravian, Nostalgia, pa, Photography, poinsettia tree, sanctuary. Bookmark the permalink. 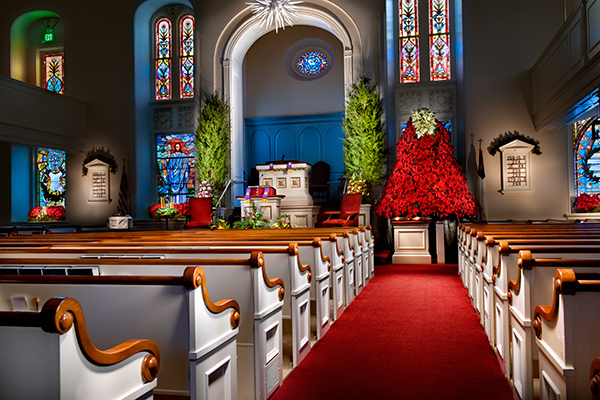 That is a beautiful church and such a neat way to display the poinsettias.